On May 19, 2001, this site’s owner, Dr. Zar, then a student at the United Methodist Church affiliated Baldwin-Wallace College, departed from Ohio for France as part of a class trip. Studying abroad is an excellent choice for many students. It gives them a chance to learn in a new place and learn new lessons that they might not have been exposed to if they’d only studied on their local campus. For Christian students, though, a semester abroad can be a chance to grow spiritually as well as academically. There are a few things that you can do to ensure that you get the most out of your time traveling the world as possible. 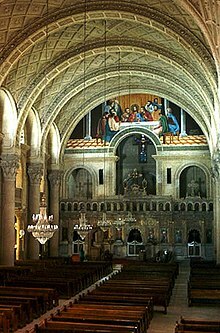 St. Mark’s Coptic Orthodox Cathedral in Alexandria, Egypt. Photograph by A. Fanous. When students are on campus or at home, they are likely to have a church that they go to frequently. At this church, they’ve probably built a community and are close with other parishioners; however, when students study abroad, you’ll be away from the church you know and love. As students travel, they’ll have the chance to experience new churches and meet new people of faith. They can even use these new connections to use some of their time studying abroad to participate in varying community outreach programs. While you are busy working with new churches, you’ll want to make sure to stay on top of your schoolwork as well. If you need help, you can look around for the best essay writing service or academic support offered by your university. George Fox University, a Christian college in Oregon. Photograph by georgefox.edu. Studying abroad gives students a chance to meet new people. A significant part of this is that you get to make new friends, but beyond that, it offers students an opportunity to learn and share cultures. Many Christian students are excited to get the chance to share their religion with others. As students meet new people, it’s a great chance to share your beliefs with them and for them to share their ideas with these students as well. It is an excellent opportunity for students and the people they meet to open their minds to different perspectives and learn something new about different cultures. International students in Liechtenstein. Photograph by Vrenibean. When studying abroad, students have the chance to visit not only the places they’ve read about but to explore locales that are unique to the new country they are in. Harkening back to the last point, though, don’t lose focus on the people that God puts in your path while you experience these new places. You are meeting them for a reason. The people around you have something to offer, aside from the lessons in faith and culture that we’ve looked at. An introduction to someone in one of a student’s classes or someone they meet when trying out a new church can be more than a casual acquaintance. These connections can be meaningful in your life in the form of networking or even as lifelong friends. Anglican and nurse, Florence Nightingale. Christian women played a role in the development and running of the modern world’s education and health care systems. Photograph by H. Lenthall, London. It’s already been mentioned that you might be introduced to new ideas in faith as you share your belief with others. When meeting new people and sharing this information, you’ll probably come to experiences that push your comfort level or otherwise challenge you. The challenges that are put in your path while you are studying abroad are, much like the new people in your way, are there for a reason. Take the chance to grow and learn not only academically but in your faith and maturity as well. The main building of St. Ignatius College (renamed John Carroll University). now part of the Saint Ignatius High School campus. Photograph by Hornandsoccer. For a Christian student, the chance to spend time abroad offers a plethora of opportunities. Don’t allow yourself to miss out on the opportunity to share and grow your faith as you explore new places and work on your academic career. Question for students: Have you ever studied abroad? If so, where? Please let us know in the comments section below this article. Morgan, Ronald J., ed. Transformations at the Edge of the World: Forming Global Christians Through the Study Abroad Experience. Abilene Christian University Press, 2010. The featured image in this article, a photograph taken by Dr. Zar when he was a student studying abroad in France in 2001, is released into the public domain, although it would be appreciated if anyone uses it to include a link back to this article.